Maybe I haven’t seen enough blogs, but I believe I’ve seen about 30 or more reviews on this palette (it’s so popular!) But every post seems to show swatches of the colours. I’m fed up with swatches, yes it gives you a better idea of how the product looks on (although I would prefer to see photos of it on the eyes) but no one explains how it lasts and how it is applies. So I thought I would do a post explaining how I found the eyeshadows rather than swatches as I assume most people have seen that a million times? Sorry if I am wrong as I’m sure a lot have people have blogged on the quality of the product I just haven’t seen it oops! Photos below show me wearing shade 6 of the MUA Undressed Palette. It hardly creased and didn’t at all feel greasy, I am so impressed. Using my real techniques brush, it applied so easily and straight away after one coat the eyeshadow was bright and glittery gold. The shadows are so pigmented which I have never found before with a palette at such a cheap price! Crossed the Urban Decay Naked palettes off of my wish list now! I love how the eye shadow stayed on so well all day without the need of a primer but I thought I would test it out with a primer too. The eye shadow stayed on SO well with the primer! It didn’t really crease or separate or feel greasy! On the back of the palette, there are instructions on how to create a smokey eye and here is a great tutorial from MUA which shows you how to create another smokey eye look. I tried this out myself but smokey eye really does not suit me! 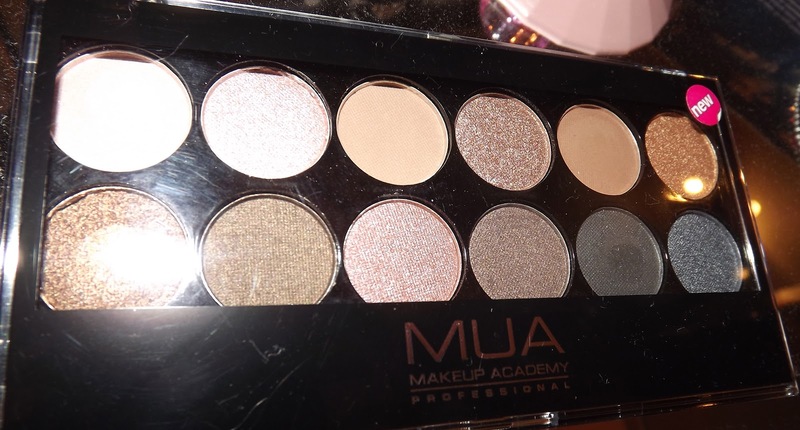 I love MUA, their products are amazing and just as good as high end products! I’ve bought so many products of theirs as presents for christmas and soon I’ll probably end up owning the whole MUA collection – it really is that great!